Today Spick & Span window cleaners went down to Barnes as part of a regular window cleaner service in Barnes, for a client who owns an attractive 7 bedroom property, which has 2 reception rooms, and 3 bathrooms, a kitchen, a study, a utility room and downstairs cloakroom . This spacious property located on a leafy street in Barnes, fronts a busy arterial road. Busy traffic on this road, means that windows get dirty very quickly making the vista outside very obscure. This is why the homeowner required a regular and reliable, window cleaner in Barnes. Spick & Span provide a regular window cleaner service in Barnes and the local area. 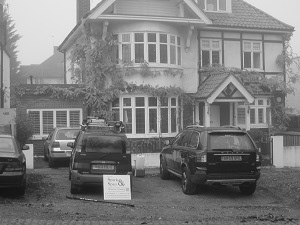 The windows of this property in Barnes are desperately difficult to clean for an unprofessional window cleaner, as like many other properties in Barnes, it has many large windows, and some that are quite awkward to reach, the windows at the front of the house are all leaded glass and are particularly difficult for novices to clean. All the windows of this property in Barnes are cleaned regularly for this client, both inside and out by Spick & Span window cleaners who are based just a 30 minute drive away from Barnes and provide regular window cleaner services in the area. The windows are cleaned by the window cleaner as regular as is required by the client, but generally they are cleaned every 4 -6 weeks both on the inside and out, this ensures that the windows are always neat in appearance and that the glass allows the maximum amount of light to penetrate into the building improving the overall feel and ambiance of the building. The property stretches over four floors, and so to reach the windows located at the very top of the building Spick & Span window cleaners use telescopic water-fed pole , which use purified water, and so thoroughly clean the glass, without leaving any marks or spots. There are four large Velux windows at the top of the property which are cleaned on each visit using traditional window cleaning methods, great care is taken to keep all carpets dry and walls clean, when using water inside the property. Because the windows of this property in Barnes have now been cleaned regularly for some time, the job takes less time, as the window cleaner has become used to the job, this is more convenient for the homeowner, who is very busy person.